Magnolia x soulangeana is a hybrid between Magnolia denudata and M. liliiflora. It was bred at the Chateau de Fromont near Paris by Etienne Soulange-Bodin in 1820. The parents are from China - M. denudata from Central and Eastern China and M. liliiflora from Southwest China. The hybid is much more widely grown than either of the parents. 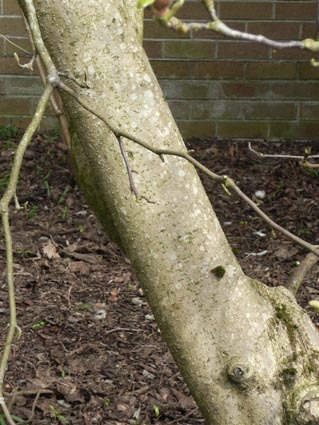 It can make a substantial tree to 20m, but is more often seen in gardens as a multi-stemmed small tree. 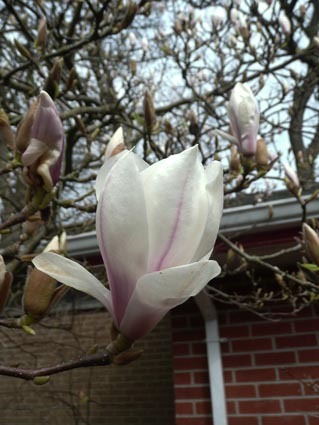 The flowers appear before the leaves and in common with all magnolias, the flowers do not have distinct sepals and petals - the many perianth segments are called tepals. 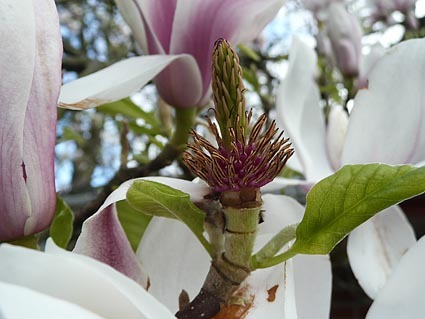 The flower parts of the Magnoliaceae are arranged in spirals unlike the arrangement in rings in most flowering plants. The spiral arrangement is found in early fossil angiosperm plants thus the family Magnoliaceae is thought to be related to the earliest of the flowering plants. 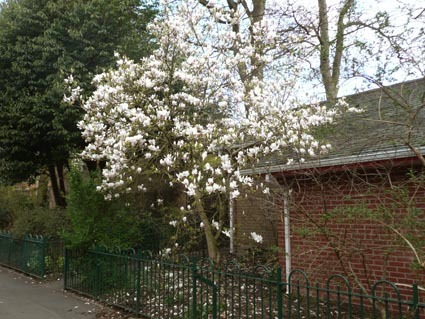 Also in the Magnoliaceae family is the genus Liriodendron (the tulip tree genus). There are some 18-20 named clones of the species, some with pure white flowers and some with various shades of pink to rosy-red. Photos taken in Belfast Botanic Gardens in 2014. Copyright: Friends of Belfast Botanic Gardens.